This article is about the transparent plastic sometimes called acrylic glass. For the glass/plastic laminate often called "safety glass", see Laminated glass. For the neurotoxic designer drug PMMA, commonly sold as MDMA, see para-Methoxy-N-methylamphetamine. For other uses, see Acrylic (disambiguation). 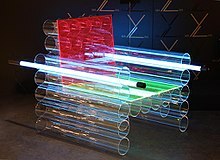 Poly(methyl methacrylate) (PMMA), also known as acrylic, acrylic glass, or plexiglass as well as by the trade names Crylux, Plexiglas, Acrylite, Lucite, and Perspex among several others (see below), is a transparent thermoplastic often used in sheet form as a lightweight or shatter-resistant alternative to glass. The same material can be used as a casting resin, in inks and coatings, and has many other uses. 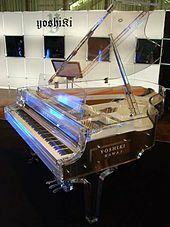 Although not a type of familiar silica-based glass, the substance, like many thermoplastics, is often technically classified as a type of glass (in that it is a non-crystalline vitreous substance) hence its occasional historical designation as acrylic glass. Chemically, it is the synthetic polymer of methyl methacrylate. The material was developed in 1928 in several different laboratories by many chemists, such as William Chalmers, Otto Röhm, and Walter Bauer, and was first brought to market in 1933 by German Röhm & Haas AG (as of January 2019 part of Evonik Industries) and its partner and former U.S. affiliate Rohm and Haas Company under the trademark Plexiglas. PMMA is an economical alternative to polycarbonate (PC) when tensile strength, flexural strength, transparency, polishability, and UV tolerance are more important than impact strength, chemical resistance and heat resistance. Additionally, PMMA does not contain the potentially harmful bisphenol-A subunits found in polycarbonate. It is often preferred because of its moderate properties, easy handling and processing, and low cost. Non-modified PMMA behaves in a brittle manner when under load, especially under an impact force, and is more prone to scratching than conventional inorganic glass, but modified PMMA is sometimes able to achieve high scratch and impact resistance. The first acrylic acid was created in 1843. Methacrylic acid, derived from acrylic acid, was formulated in 1865. The reaction between methacrylic acid and methanol results in the ester methyl methacrylate. Polymethyl methacrylate was discovered in the early 1930s by British chemists Rowland Hill and John Crawford at Imperial Chemical Industries (ICI) in England. ICI registered the product under the trademark Perspex. About the same time, chemist and industrialist Otto Röhm of Rohm and Haas AG in Germany attempted to produce safety glass by polymerizing methyl methacrylate between two layers of glass. The polymer separated from the glass as a clear plastic sheet, which Röhm gave the trademarked name Plexiglas in 1933. Both Perspex and Plexiglas were commercialized in the late 1930s. In the United States, E.I. du Pont de Nemours & Company (now DuPont Company) subsequently introduced its own product under the trademark Lucite. In 1936 ICI Acrylics (now Lucite International) began the first commercially viable production of acrylic safety glass. During World War II both Allied and Axis forces used acrylic glass for submarine periscopes and aircraft windshields, canopies, and gun turrets. Airplane pilots whose eyes were damaged by flying shards of PMMA fared much better than those injured by standard glass, demonstrating better compatibility between human tissue and PMMA than glass. Civilian applications followed after the war. Although PMMA is often called simply "acrylic", acrylic can also refer to other polymers or copolymers containing polyacrylonitrile. Notable trade names include Acrylite, Lucite, R-Cast, Plexiglas, Optix, Perspex, Oroglas, Altuglas, Cyrolite, and Sumipex. PMMA is routinely produced by emulsion polymerization, solution polymerization, and bulk polymerization. Generally, radical initiation is used (including living polymerization methods), but anionic polymerization of PMMA can also be performed. To produce 1 kg (2.2 lb) of PMMA, about 2 kg (4.4 lb) of petroleum is needed. PMMA produced by radical polymerization (all commercial PMMA) is atactic and completely amorphous. The glass transition temperature (Tg) of atactic PMMA is 105 °C (221 °F). The Tg values of commercial grades of PMMA range from 85 to 165 °C (185 to 329 °F); the range is so wide because of the vast number of commercial compositions which are copolymers with co-monomers other than methyl methacrylate. PMMA is thus an organic glass at room temperature; i.e., it is below its Tg. The forming temperature starts at the glass transition temperature and goes up from there. All common molding processes may be used, including injection molding, compression molding, and extrusion. The highest quality PMMA sheets are produced by cell casting, but in this case, the polymerization and molding steps occur concurrently. The strength of the material is higher than molding grades owing to its extremely high molecular mass. Rubber toughening has been used to increase the toughness of PMMA to overcome its brittle behavior in response to applied loads. PMMA can be joined using cyanoacrylate cement (commonly known as superglue), with heat (welding), or by using chlorinated solvents such as dichloromethane or trichloromethane (chloroform) to dissolve the plastic at the joint, which then fuses and sets, forming an almost invisible weld. Scratches may easily be removed by polishing or by heating the surface of the material. Laser cutting may be used to form intricate designs from PMMA sheets. PMMA vaporizes to gaseous compounds (including its monomers) upon laser cutting, so a very clean cut is made, and cutting is performed very easily. However, the pulsed lasercutting introduces high internal stresses along the cut edge, which on exposure to solvents produce undesirable "stress-crazing" at the cut edge and several millimetres deep. Even ammonium-based glass-cleaner and almost everything short of soap-and-water produces similar undesirable crazing, sometimes over the entire surface of the cut parts, at great distances from the stressed edge. Annealing the PMMA sheet/parts is therefore an obligatory post-processing step when intending to chemically bond lasercut parts together. In the majority of applications, it will not shatter. Rather, it breaks into large dull pieces. Since PMMA is softer and more easily scratched than glass, scratch-resistant coatings are often added to PMMA sheets to protect it (as well as possible other functions). Methyl methacrylate "synthetic resin" for casting (simply the bulk liquid chemical) may be used in conjunction with a polymerization catalyst such as methyl ethyl ketone peroxide (MEKP), to produce hardened transparent PMMA in any shape, from a mold. Objects like insects or coins, or even dangerous chemicals in breakable quartz ampules, may be embedded in such "cast" blocks, for display and safe handling. PMMA is a strong, tough, and lightweight material. 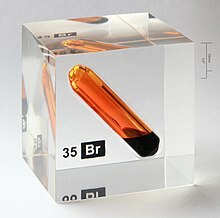 It has a density of 1.17–1.20 g/cm3, which is less than half that of glass. It also has good impact strength, higher than both glass and polystyrene; however, PMMA's impact strength is still significantly lower than polycarbonate and some engineered polymers. PMMA ignites at 460 °C (860 °F) and burns, forming carbon dioxide, water, carbon monoxide and low-molecular-weight compounds, including formaldehyde. PMMA transmits up to 92% of visible light (3 mm thickness), and gives a reflection of about 4% from each of its surfaces due to its refractive index (1.4905 at 589.3 nm). It filters ultraviolet (UV) light at wavelengths below about 300 nm (similar to ordinary window glass). Some manufacturers add coatings or additives to PMMA to improve absorption in the 300–400 nm range. PMMA passes infrared light of up to 2,800 nm and blocks IR of longer wavelengths up to 25,000 nm. Colored PMMA varieties allow specific IR wavelengths to pass while blocking visible light (for remote control or heat sensor applications, for example). PMMA swells and dissolves in many organic solvents; it also has poor resistance to many other chemicals due to its easily hydrolyzed ester groups. Nevertheless, its environmental stability is superior to most other plastics such as polystyrene and polyethylene, and PMMA is therefore often the material of choice for outdoor applications. PMMA has a maximum water absorption ratio of 0.3–0.4% by weight. Tensile strength decreases with increased water absorption. Its coefficient of thermal expansion is relatively high at (5–10)×10−5 °C−1. A small amount of acrylate comonomers are routinely used in PMMA grades destined for heat processing, since this stabilizes the polymer to depolymerization ("unzipping") during processing. Comonomers such as butyl acrylate are often added to improve impact strength. Comonomers such as methacrylic acid can be added to increase the glass transition temperature of the polymer for higher temperature use such as in lighting applications. Plasticizers may be added to improve processing properties, lower the glass transition temperature, or improve impact properties. Dyes may be added to give color for decorative applications, or to protect against (or filter) UV light. Fillers may be added to improve cost-effectiveness. The polymer of methyl acrylate, PMA or poly(methyl acrylate), is similar to poly(methyl methacrylate), except for the lack of methyl groups on the backbone carbon chain. PMA is a soft white rubbery material that is softer than PMMA because its long polymer chains are thinner and smoother and can more easily slide past each other. Being transparent and durable, PMMA is a versatile material and has been used in a wide range of fields and applications such as rear-lights and instrument clusters for vehicles, appliances, and lenses for glasses. PMMA in the form of sheets affords to shatter resistant panels for building windows, skylights, bulletproof security barriers, signs & displays, sanitary ware (bathtubs), LCD screens, furniture and many other applications. It is also used for coating polymers based on MMA provides outstanding stability against environmental conditions with reduced emission of VOC. Methacrylate polymers are used extensively in medical and dental applications where purity and stability are critical to performance. 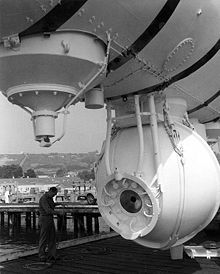 Close-up of pressure sphere of Bathyscaphe Trieste, with a single conical window of PMMA (Plexiglas) set into sphere hull. The very small black circle (smaller than the man's head) is the inner side of the plastic "window," and is only a few inches in diameter. The larger circular clear black area represents the larger outer-side of the thick one-piece plastic cone "window." PMMA is commonly used for constructing residential and commercial aquariums. 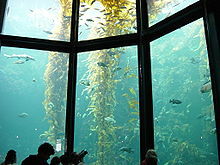 Designers started building large aquariums when poly(methyl methacrylate) could be used. It is less often used in other building types due to incidents such as the Summerland disaster. PMMA is used for viewing ports and even complete pressure hulls of submersibles, such as the Alicia submarine's viewing sphere and the window of the bathyscaphe Trieste. PMMA is used in the lenses of exterior lights of automobiles. Spectator protection in ice hockey rinks is made from PMMA. Historically, PMMA was an important improvement in the design of aircraft windows, making possible such designs as the bombardier's transparent nose compartment in the Boeing B-17 Flying Fortress. Modern aircraft transparencies often use stretched acrylic plies. Police vehicles for riot control often have the regular glass replaced with PMMA to protect the occupants from thrown objects. PMMA is an important material in the making of certain lighthouse lenses. PMMA was used for the roofing of the compound in the Olympic Park for the 1972 Summer Olympics in Munich. It enabled a light and translucent construction of the structure. PMMA (under the brand name "Lucite") was used for the ceiling of the Houston Astrodome. Laser cut acrylic panels have been used to redirect sunlight into a light pipe or tubular skylight and, from there, to spread it into a room. Their developers Veronica Garcia Hansen, Ken Yeang, and Ian Edmonds were awarded the Far East Economic Review Innovation Award in bronze for this technology in 2003. Attenuation being quite strong for distances over one meter (more than 90% intensity loss for a 3000 K source), acrylic broadband light guides are then dedicated mostly to decorative uses. Pairs of acrylic sheets with a layer of microreplicated prisms between the sheets can have reflective and refractive properties that let them redirect part of incoming sunlight in dependence on its angle of incidence. Such panels act as miniature light shelves. Such panels have been commercialized for purposes of daylighting, to be used as a window or a canopy such that sunlight descending from the sky is directed to the ceiling or into the room rather than to the floor. This can lead to a higher illumination of the back part of a room, in particular when combined with a white ceiling, while having a slight impact on the view to the outside compared to normal glazing. PMMA has a good degree of compatibility with human tissue, and it is used in the manufacture of rigid intraocular lenses which are implanted in the eye when the original lens has been removed in the treatment of cataracts. This compatibility was discovered by the English ophthalmologist Sir Harold Ridley in WWII RAF pilots, whose eyes had been riddled with PMMA splinters coming from the side windows of their Supermarine Spitfire fighters – the plastic scarcely caused any rejection, compared to glass splinters coming from aircraft such as the Hawker Hurricane. Ridley had a lens manufactured by the Rayner company (Brighton & Hove, East Sussex) made from Perspex polymerised by ICI. On 29 November 1949 at St Thomas' Hospital, London, Ridley implanted the first intraocular lens at St Thomas's Hospital in London. In particular, acrylic-type contact lenses are useful for cataract surgery in patients that have recurrent ocular inflammation (uveitis), as acrylic material induces less inflammation. Eyeglass lenses are commonly made from PMMA. Historically, hard contact lenses were frequently made of this material. Soft contact lenses are often made of a related polymer, where acrylate monomers containing one or more hydroxyl groups make them hydrophilic. In orthopedic surgery, PMMA bone cement is used to affix implants and to remodel lost bone. It is supplied as a powder with liquid methyl methacrylate (MMA). Although PMMA is biologically compatible, MMA is considered to be an irritant and a possible carcinogen. PMMA has also been linked to cardiopulmonary events in the operating room due to hypotension. Bone cement acts like a grout and not so much like a glue in arthroplasty. Although sticky, it does not bond to either the bone or the implant, it primarily fills the spaces between the prosthesis and the bone preventing motion. A disadvantage of this bone cement is that it heats up to 82.5 °C (180.5 °F) while setting that may cause thermal necrosis of neighboring tissue. A careful balance of initiators and monomers is needed to reduce the rate of polymerization, and thus the heat generated. In cosmetic surgery, tiny PMMA microspheres suspended in some biological fluid are injected as a soft tissue filler under the skin to reduce wrinkles or scars permanently. PMMA as a soft tissue filler was widely used in the beginning of the century to restore volume in patients with HIV-related facial wasting. PMMA is used illegally to shape muscles by some bodybuilders. Plombage is an outdated treatment of tuberculosis where the pleural space around an infected lung was filled with PMMA balls, in order to compress and collapse the affected lung. Emerging biotechnology and Biomedical research uses PMMA to create microfluidic lab-on-a-chip devices, which require 100 micrometre-wide geometries for routing liquids. These small geometries are amenable to using PMMA in a biochip fabrication process and offers moderate biocompatibility. Bioprocess chromatography columns use cast acrylic tubes as an alternative to glass and stainless steel. These are pressure rated and satisfy stringent requirements of materials for biocompatibility, toxicity and extractables. Due to its aforementioned biocompatibility, Poly(methyl methacrylate) is a commonly used material in modern dentistry, particularly in the fabrication of dental prosthetics, artificial teeth, and orthodontic appliances. Acrylic Prosthetic Construction: Pre-polymerized, powdered PMMA spheres are mixed with a Methyl Methacrylate liquid monomer, Benzoyl Peroxide (initiator), and NN-Dimethyl-P-Toluidine (accelerator), and placed under heat and pressure to produce a hardened polymerized PMMA structure. Through the use of injection molding techniques, wax based designs with artificial teeth set in predetermined positions built on gypsum stone models of patients' mouths can be converted into functional prosthetics used to replace missing dentition. PMMA polymer and methyl methacrylate monomer mix is then injected into a flask containing a gypsum mold of the previously designed prosthesis, and placed under heat to initiate polymerization process. Pressure is used during the curing process to minimize polymerization shrinkage, ensuring an accurate fit of the prosthesis. Though other methods of polymerizing PMMA for prosthetic fabrication exist, such as chemical and microwave resin activation, the previously described heat-activated resin polymerization technique is the most commonly used due to its cost effectiveness and minimal polymerization shrinkage. Artificial Teeth: While denture teeth can be made of several different materials, PMMA is a material of choice for the manufacturing of artificial teeth used in dental prosthetics. Mechanical properties of the material allow for heightened control of aesthetics, easy surface adjustments, decreased risk of fracture when in function in the oral cavity, and minimal wear against opposing teeth. Additionally, since the bases of dental prosthetics are often constructed using PMMA, adherence of PMMA denture teeth to PMMA denture bases is unparalleled, leading to the construction of a strong and durable prosthetic. Acrylic paint essentially consists of PMMA suspended in water; however since PMMA is hydrophobic, a substance with both hydrophobic and hydrophilic groups needs to be added to facilitate the suspension. Modern furniture makers, especially in the 1960s and 1970s, seeking to give their products a space age aesthetic, incorporated Lucite and other PMMA products into their designs, especially office chairs. Many other products (for example, guitars) are sometimes made with acrylic glass to make the commonly opaque objects translucent. Perspex has been used as a surface to paint on, for example by Salvador Dalí. 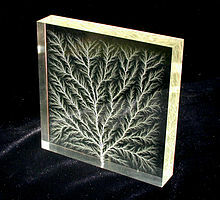 Diasec is a process which uses acrylic glass as a substitute for normal glass in picture frames. This is done for its relatively low cost, light weight, shatter-resistance, aesthetics and because it can be ordered in larger sizes than standard picture framing glass. From approximately the 1960s onward, sculptors and glass artists such as Jan Kubíček, Leroy Lamis, and Frederick Hart began using acrylics, especially taking advantage of the material's flexibility, light weight, cost and its capacity to refract and filter light. In the 1950s and 1960s, Lucite was an extremely popular material for jewelry, with several companies specialized in creating high-quality pieces from this material. Lucite beads and ornaments are still sold by jewelry suppliers. Acrylic Sheets are produced in dozens of standard colors, most commonly sold using color numbers developed by Rohm & Haas in the 1950s. PMMA, in the commercial form Tecnovit 7200 is used vastly in the medical field. It is used for plastic histology, electron micropsy, as well as many more uses. PMMA has been used to create ultra-white opaque membranes that are flexible and switch appearance to transparent when wet. Sheets of PMMA are commonly used in the sign industry to make flat cut out letters in thicknesses typically varying from 3 to 25 millimeters (0.1 to 1.0 in). These letters may be used alone to represent a company's name and/or logo, or they may be a component of illuminated channel letters. Acrylic is also used extensively throughout the sign industry as a component of wall signs where it may be a backplate, painted on the surface or the backside, a faceplate with additional raised lettering or even photographic images printed directly to it, or a spacer to separate sign components. It is used as a light guide for the backlights in TFT-LCDs. Plastic optical fiber used for short distance communication is made from PMMA, and perfluorinated PMMA, clad with fluorinated PMMA, in situations where its flexibility and cheaper installation costs outweigh its poor heat tolerance and higher attenuation over glass fiber. PMMA, in a purified form, is used as the matrix in laser dye-doped organic solid-state gain media for tunable solid state dye lasers. In semiconductor research and industry, PMMA aids as a resist in the electron beam lithography process. A solution consisting of the polymer in a solvent is used to spin coat silicon and other semiconducting and semi-insulating wafers with a thin film. Patterns on this can be made by an electron beam (using an electron microscope), deep UV light (shorter wavelength than the standard photolithography process), or X-rays. Exposure to these creates chain scission or (de-cross-linking) within the PMMA, allowing for the selective removal of exposed areas by a chemical developer, making it a positive photoresist. PMMA's advantage is that it allows for extremely high resolution patterns to be made. Smooth PMMA surface can be easily nanostructured by treatment in oxygen radio-frequency plasma and nanostructured PMMA surface can be easily smoothed by vacuum ultraviolet (VUV) irradiation. PMMA is used as a shield to stop beta radiation emitted from radioisotopes. Small strips of PMMA are used as dosimeter devices during the Gamma Irradiation process. The optical properties of PMMA change as the gamma dose increases, and can be measured with a spectrophotometer. A blacklight-reactive tattoo ink using PMMA microcapsules has been developed. PMMA can be used as a dispersant for ceramic powders to stabilize colloidal suspensions in non-aqueous media. Due to its high viscosity upon dissolution, it can also be used as binder material for solution deposition processes, e.g. printing of solar cells. In the 1960s, luthier Dan Armstrong developed a line of electric guitars and basses whose bodies were made completely of acrylic. These instruments were marketed under the Ampeg brand. Ibanez and B.C. Rich have also made acrylic guitars. Ludwig-Musser makes a line of acrylic drums called Vistalites, well known as being used by Led Zeppelin drummer John Bonham. Artificial nails in the "acrylic" type often include PMMA powder. Some modern briar, and occasionally meerschaum, tobacco pipes sport stems made of Lucite. PMMA technology is utilized in roofing and waterproofing applications. By incorporating a polyester fleece sandwiched between two layers of catalyst-activated PMMA resin, a fully reinforced liquid membrane is created in situ. PMMA is a widely used material to create deal toys and financial tombstones. The Futuro house was made of fibreglass-reinforced polyester plastic, polyester-polyurethane, and poly(methylmethacrylate); one of them was found to be degrading by cyanobacteria and Archaea. ^ a b c Polymethylmethacrylate (PMMA, Acrylic) Archived 2015-04-02 at the Wayback Machine. Makeitfrom.com. Retrieved 2015-03-23. ^ Wapler, M. C.; Leupold, J.; Dragonu, I.; von Elverfeldt, D.; Zaitsev, M.; Wallrabe, U. (2014). "Magnetic properties of materials for MR engineering, micro-MR and beyond". JMR. 242 (2014): 233–242. arXiv:1403.4760. Bibcode:2014JMagR.242..233W. doi:10.1016/j.jmr.2014.02.005. PMID 24705364. ^ a b Refractive index and related constants – Poly(methyl methacrylate) (PMMA, Acrylic glass) Archived 2014-11-06 at the Wayback Machine. Refractiveindex.info. Retrieved 2014-10-27. ^ Smith, William F.; Hashemi, Javad (2006). Foundations of Materials Science and Engineering (4th ed.). McGraw-Hill. p. 509. ISBN 978-0-07-295358-9. ^ Hydrosight. "Acrylic vs. Polycarbonate: A quantitative and qualitative comparison". Archived from the original on 2017-01-19. ^ "Polymethyl methacrylate | chemical compound". Archived from the original on 2017-10-31. Retrieved 2017-05-22. ^ "Polymethyl methacrylate". Merriam-Webster Dictionary. ^ "Acrylite Online Shop | Cut-to-Size | Sheets | Rods | Tubes". Acrylite.co. Archived from the original on 2013-10-07. Retrieved 2018-11-15. ^ "Trademark Electronic Search System". TESS. US Patent and Trademark Office. p. Search for Registration Number 0350093. Retrieved 29 June 2014. ^ "R-Cast® a Brief History". Reynoldspolymer.com. Archived from the original on 2015-09-24. ^ a b c d Charles A. Harper; Edward M. Petrie (10 October 2003). Plastics Materials and Processes: A Concise Encyclopedia. John Wiley & Sons. p. 9. ISBN 978-0-471-45920-0. Archived from the original on 20 April 2016. ^ Reed Business Information (13 June 1974). "Misused materials stoked Sumerland fire". 62 (902). IPC Magazines: 684. ISSN 0262-4079. Archived from the original on 21 April 2016. ^ David K. Platt (1 January 2003). Engineering and High Performance Plastics Market Report: A Rapra Market Report. Smithers Rapra. p. 170. ISBN 978-1-85957-380-8. Archived from the original on 21 April 2016. ^ Ashby, Michael F. (2005). Materials Selection in Mechanical Design (3rd ed.). Elsevier. p. 519. ISBN 978-0-7506-6168-3. ^ "Working with Plexiglas&®" Archived 2015-02-21 at the Wayback Machine. science-projects.com. ^ Andersen, Hans J. "Tensions in acrylics when laser cutting". Archived from the original on 8 December 2015. Retrieved 23 December 2014. ^ a b DATA TABLE FOR: Polymers: Commodity Polymers: PMMA Archived 2007-12-13 at the Wayback Machine. Matbase.com. Retrieved 2012-05-09. ^ Zeng, W. R.; Li, S. F.; Chow, W. K. (2002). "Preliminary Studies on Burning Behavior of Polymethylmethacrylate (PMMA)". Journal of Fire Sciences. 20 (4): 297–317. doi:10.1177/073490402762574749. hdl:10397/31946. INIST:14365060. ^ Altuglas International Plexiglas UF-3 UF-4 and UF-5 sheets Archived 2006-11-17 at the Wayback Machine. Plexiglas.com. Retrieved 2012-05-09. ^ Ishiyama, Chiemi; Yamamoto, Yoshito; Higo, Yakichi (2005). Buchheit, T.; Minor, A.; Spolenak, R.; et al., eds. "Effects of Humidity History on the Tensile Deformation Behaviour of Poly(methyl –methacrylate) (PMMA) Films". MRS Proceedings. 875: O12.7. doi:10.1557/PROC-875-O12.7. ^ "Tangram Technology Ltd. – Polymer Data File – PMMA". Archived from the original on 2010-04-21. ^ Polymethyl acrylate and polyethyl acrylate, Encyclopædia Britannica Archived 2007-04-28 at the Wayback Machine. Encyclopædia Britannica. Retrieved 2012-05-09. ^ Kutz, Myer (2002). Handbook of Materials Selection. John Wiley & Sons. p. 341. ISBN 978-0-471-35924-1. ^ Terry Pepper, Seeing the Light, Illumination Archived 2009-01-23 at the Wayback Machine. Terrypepper.com. Retrieved 2012-05-09. ^ Deplazes, Andrea, ed. (2013). Constructing Architecture – Materials Processes Structures, A Handbook. Birkhäuser. ISBN 978-3038214526. ^ Gerchikov, Victor; Mossman, Michele; Whitehead, Lorne (2005). "Modeling Attenuation versus Length in Practical Light Guides". LEUKOS. 1 (4): 47–59. doi:10.1582/LEUKOS.01.04.003 (inactive 2019-03-14). ^ How Serraglaze works Archived 2009-03-05 at the Wayback Machine. Bendinglight.co.uk. Retrieved 2012-05-09. ^ Apple, David J (2006). Sir Harold Ridely and His Fight for Sight: He Changed the World So That We May Better See It. Thorofare NJ USA: Slack. ISBN 978-1-55642-786-2. ^ Kaufmann, Timothy J.; Jensen, Mary E.; Ford, Gabriele; Gill, Lena L.; Marx, William F.; Kallmes, David F. (2002-04-01). "Cardiovascular Effects of Polymethylmethacrylate Use in Percutaneous Vertebroplasty". American Journal of Neuroradiology. 23 (4): 601–4. PMID 11950651. ^ "Filling in Wrinkles Safely". U.S. Food and Drug Administration. February 28, 2015. Archived from the original on 21 November 2015. Retrieved 8 December 2015. ^ Prosthodontic treatment for edentulous patients : complete dentures and implant-supported prostheses. Zarb, George A. (George Albert), 1938- (13th ed.). St. Louis, Mo. : Elsevier Mosby. 2013. ISBN 9780323078443. OCLC 773020864. ^ Syurik, Julia; Jacucci, Gianni; Onelli, Olimpia D.; Holscher, Hendrik; Vignolini, Silvia (22 February 2018). "Bio-inspired Highly Scattering Networks via Polymer Phase Separation". Advanced Functional Materials. 28 (24): 1706901. doi:10.1002/adfm.201706901. ^ Goodman, Robert L. (2002-11-19). How Electronic Things Work... And What to do When They Don't. McGraw Hill Professional. ISBN 9780071429245. ^ Duarte, F. J. (Ed. ), Tunable Laser Applications (CRC, New York, 2009) Chapters 3 and 4. ^ a b Lapshin, R. V.; Alekhin, A. P.; Kirilenko, A. G.; Odintsov, S. L.; Krotkov, V. A. (2010). "Vacuum ultraviolet smoothing of nanometer-scale asperities of Poly(methyl methacrylate) surface". Journal of Surface Investigation. X-ray, Synchrotron and Neutron Techniques. 4 (1): 1–11. doi:10.1134/S1027451010010015. ^ – Blacklight Tattoo Ink – Blacklight Tattoo Ink FAQ Archived 2012-01-04 at the Wayback Machine. Crazychameleonbodyartsupply.com. Retrieved 2012-05-09. ^ Uhl, Alexander R.; Romanyuk, Yaroslav E.; Tiwari, Ayodhya N. (2011). "Thin film Cu(In,Ga)Se2 solar cells processed from solution pastes with polymethyl methacrylate binder". Thin Solid Films. 519 (21): 7259–63. Bibcode:2011TSF...519.7259U. doi:10.1016/j.tsf.2011.01.136. ^ JS2K-PLT Archived 2007-09-28 at the Wayback Machine. Ibanezregister.com. Retrieved 2012-05-09. ^ Symington, Jan (2006). "Salon management". Australian nail technology. Croydon, Victoria, Australia: Tertiary Press. p. 11. ISBN 978-0864585981. ^ Cappitelli, Francesca; Principi, Pamela; Sorlini, Claudia (2006). "Biodeterioration of modern materials in contemporary collections: Can biotechnology help?". Trends in Biotechnology. 24 (8): 350–4. doi:10.1016/j.tibtech.2006.06.001. PMID 16782219. ^ Rinaldi, Andrea (2006). "Saving a fragile legacy. Biotechnology and microbiology are increasingly used to preserve and restore the world's cultural heritage". EMBO Reports. 7 (11): 1075–9. doi:10.1038/sj.embor.7400844. PMC 1679785. PMID 17077862.